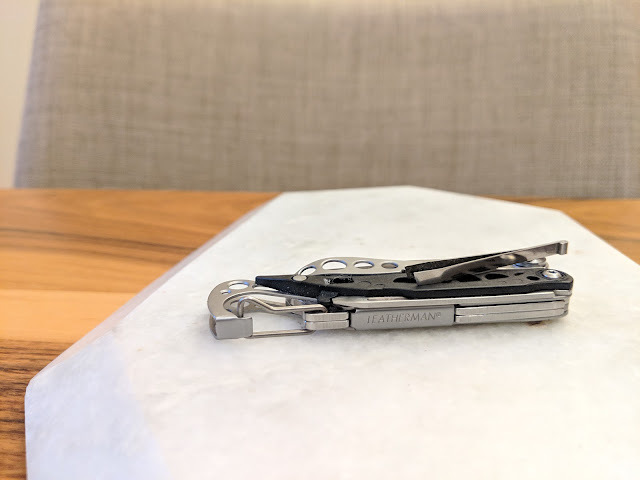 Today I'm taking a look at the Leatherman Style PS. This is a key chain-sized, plier-type multi-tool. 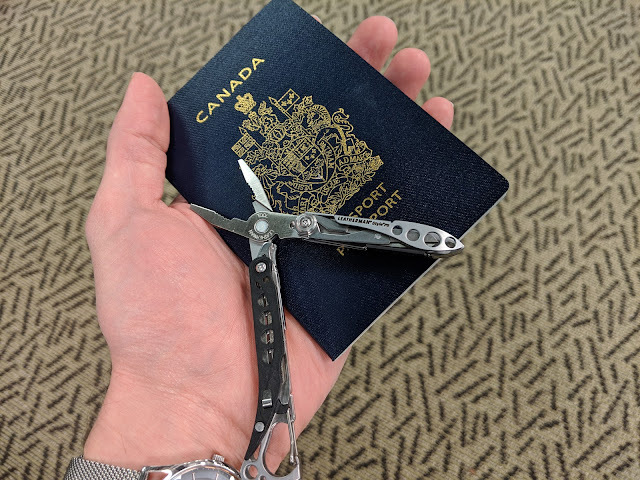 The most notable feature of this tool is the lack of any blades, which Leatherman claims makes it TSA-friendly. I took this with me on my last trip and while they were sure to look over it closely, they didn't have any issues letting it though. Obviously this is still no guarantee and will vary by country, but it also helps that this tool is cheap enough I wouldn't be heartbroken if they decided not to let it by. 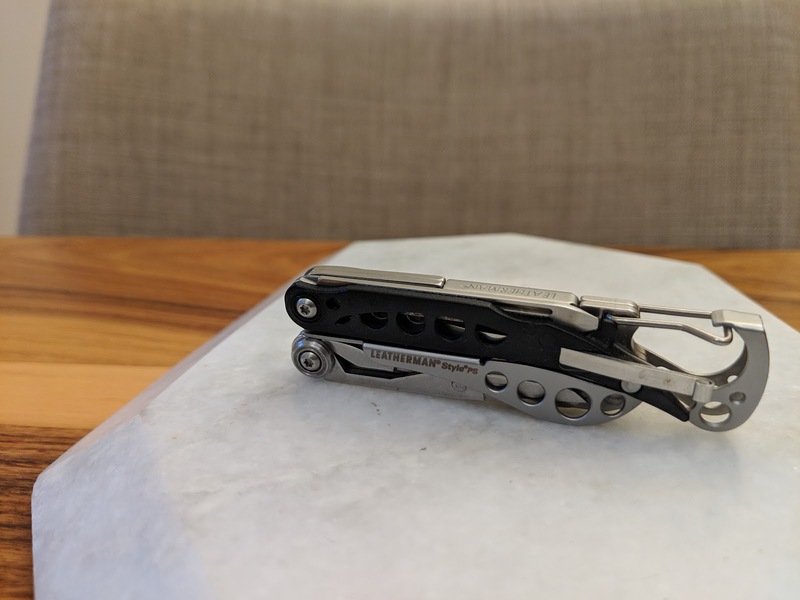 It should be noted that Leatherman also make the very similar Style CS - this version replaces the pliers with larger scissors, and the scissors with a knife, but is otherwise identical. 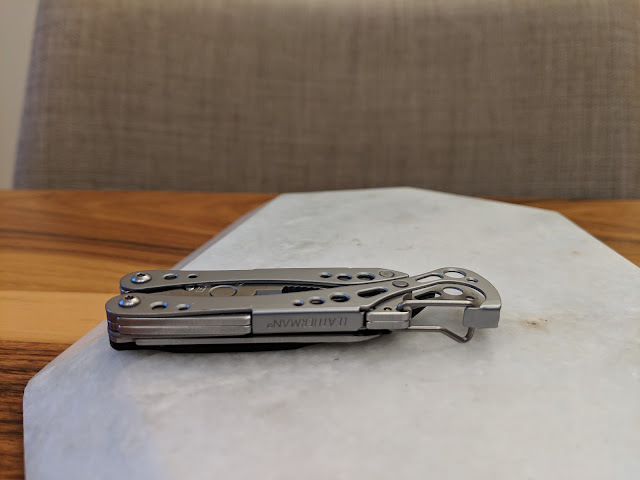 This is my first multi-tool review, so please let me know if you have any feedback! 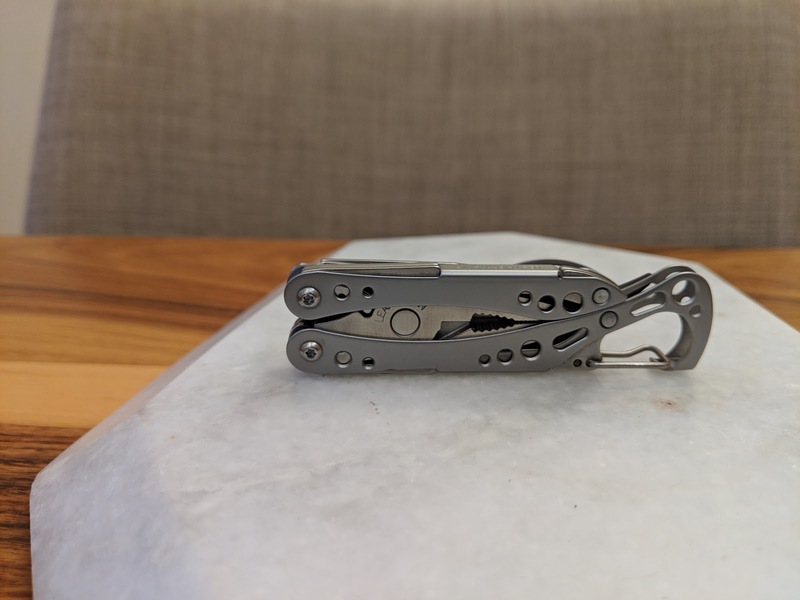 Closed, this multi-tool measures 75.6 by 20.5 by 8.9 mm. When the pliers are open, the shorter of the two handles measures about 72 mm long from the pivot. The body of this tool, and the tools inside, are all made of stainless steel. The tools are held in place with Torx bolts, but there are some rivets used for the mechanism. One scale on one side is made of glass filled nylon as well, which houses the tweezers. The metal has a brushed-looking finish on it. After over a month of sharing a pocket with my keys, it hasn't shown any wear at all. Leatherman markets this tool as having 8 tools overall, but I find the manufacturer tool counts can be a bit misleading. The main tool on this multi-tool is the spring-loaded needle nose pliers. These are small enough that you won't be doing any heavy work with them, but they're perfectly functional. The pliers also have a wider "regular" section, and some wire cutters. 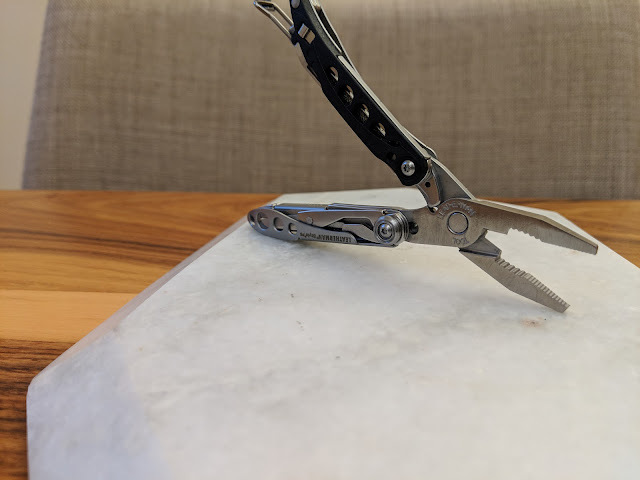 When closed, the end of the pliers lines up perfectly. The spring action is great, something I wish was included on more of the brand's full size tools. The pliers are not locking. The remainder of the tools are readily accessible while the pliers are folded shut. One side has a small pair of spring-loaded scissors. These are sharp, and I didn't have any issues cutting with them. 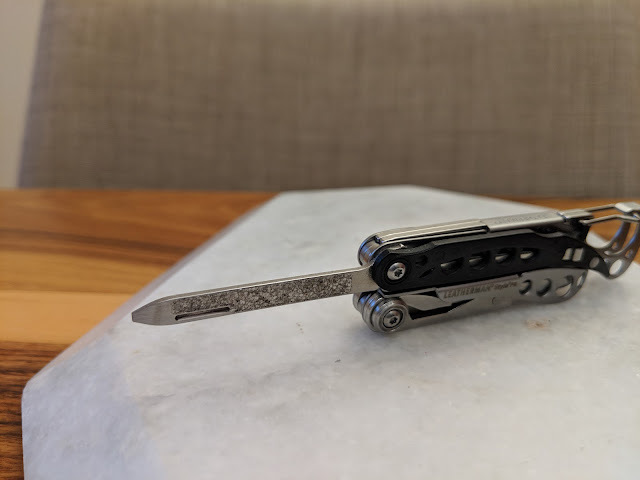 Interestingly enough, there's a thumb nick on the blades to help open them, but in the closed position it's hidden inside the body of the tool - I can only assume these scissors are shared with another tool where that nick serves a purpose. The other handle of the tool houses a nail file, with a flat head screwdriver on the end. Inside the same handle, there's a small set of slant-tipped tweezers. This is one of the main reasons to get a tool from the Style lineup as opposed to the similar Squirt tools. Getting the tweezers out can be a bit tough. 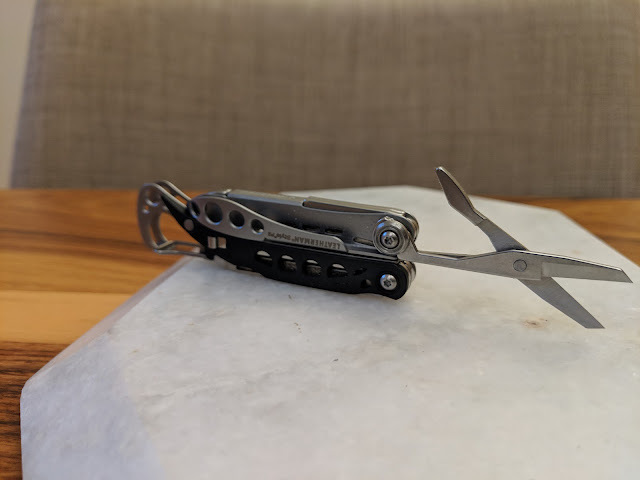 Finally, the end of the tool has a carabiner that doubles as a bottle opener. I found that the diminutive size of this tool meant it commonly takes two pries to open up a bottle, but I like that it's always accessible and doesn't need to be unfolded before use. A tool this small is either going to be carried clipped to something like a keychain or bag, or just bare in a pocket. The carabiner has a small detent in the wire gate that you can toggle with your thumb to open it up easily. If you don't trust the built in clip, there's a large hole in the end of the tool for more permanent attachment of a key chain or lanyard. As far as ergonomics, there's not much to say with a tiny tool like this - it's size means it's really not intended for huge amounts of force. When using the pliers, the handles are designed so that most of the clamping force is applied to flat surfaces and not edges, which should help with comfort. The scissors are positioned so that you can hold the tool enclosed in your hand and actuate them easily with just your thumb.